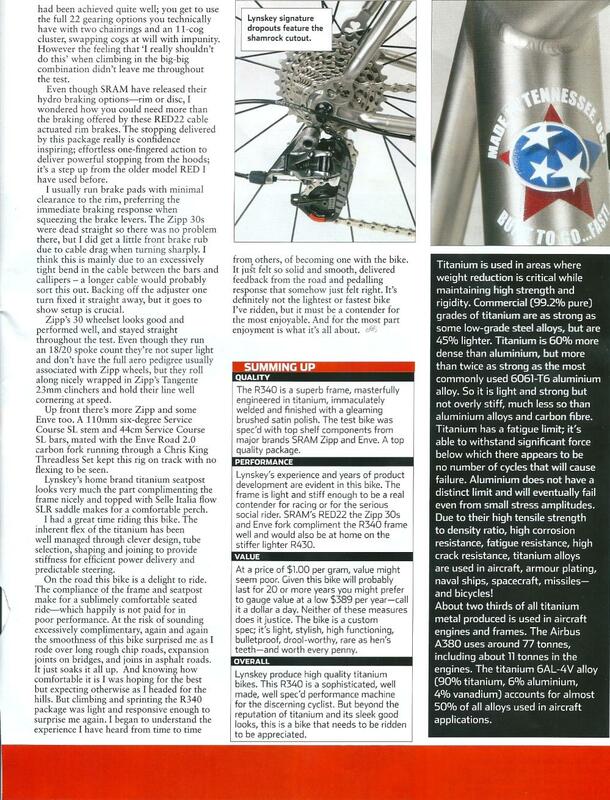 My first road bike was 7075 aluminium and man was it harsh – improved somewhat with a carbon fork upgrade. 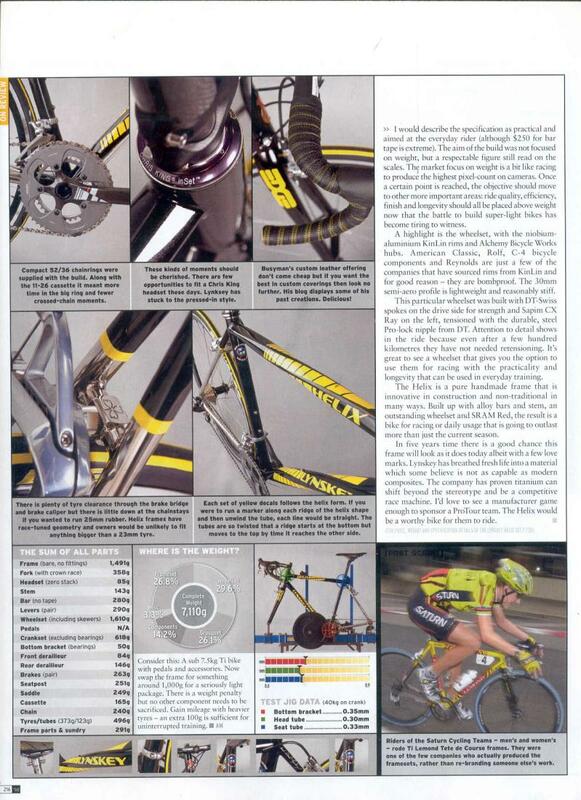 2 years later I bought a Pinarello Opera steel framed bike with the then new carbon seat-stays affording a plush ride. Next was a Cervelo R3 with the legendary ultra-thin seat-stays. It was stiff and very responsive but comfortable at the same time. Unfortunately it got crashed and was replaced with a Trek Domane which has never felt right. So after over a year of back soreness I’m now riding a Lynskey R230 titanium bike. It is so smooth on the road but has a lively zing which is missing in my carbon framed bikes. 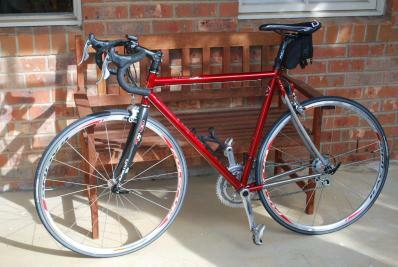 It feels stiffer & more responsive than my steel bike but probably more comfortable – I’ve finally found my perfect ride! 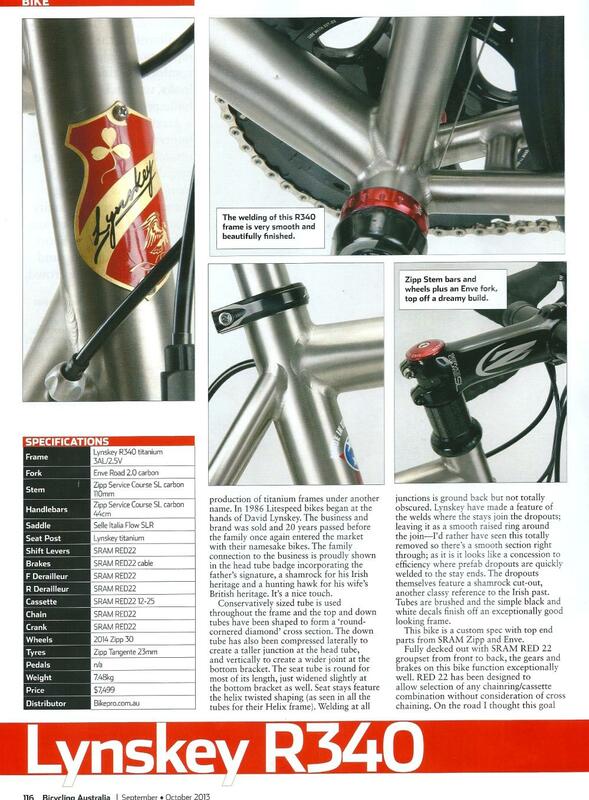 thought I'd write to let you know how Kate is going with her Lynskey Peloton. In short, she loves it. One of her other bikes is a Trek Domane 5.2 (mechanical Ultegra 6700) and the Lynskey was only ever meant to (a) make use of some Campag gear (2007 Centaur group, Zonda wheels etc) that was sitting in an unused too-quick-steering Wilier, and (b) be a back-up or 'B' bike in case there was ever a problem with the Trek. Interestingly, the Lynskey has become her 'A' bike. I think that says a lot about Lynskey and titanium. I think it also says a bit about Campag vs Shimano, but best not to go there! Kate's really happy with stability on descents - and we have some long, fast and bumpy ones around here so that's a really important attribute. It's also a much smoother ride than she thought it was going to be. Currently running 25mm Vittoria Rubino Pros at about 95-100 psi, which seems to work on this bike. I thought they'd be a bit stiff in the sidewall but the frame's compliance seems to make up for that. One unexpected thing is that, although the bike feels a bit heavier than the Trek, Kate prefers climbing on the Lynskey. Go figure. We're off to Victoria in March to do the 7 Peaks - Baw Baw, Hotham etc - over 10 days as well as the Scody High Country Cycle Challenge up Mt Buller, and Kate's decided to to take the Lynskey. Another bonus, if you could call it that, is that it attracts a lot of attention and people always want to have a closer look and find out what Kate thinks about it. 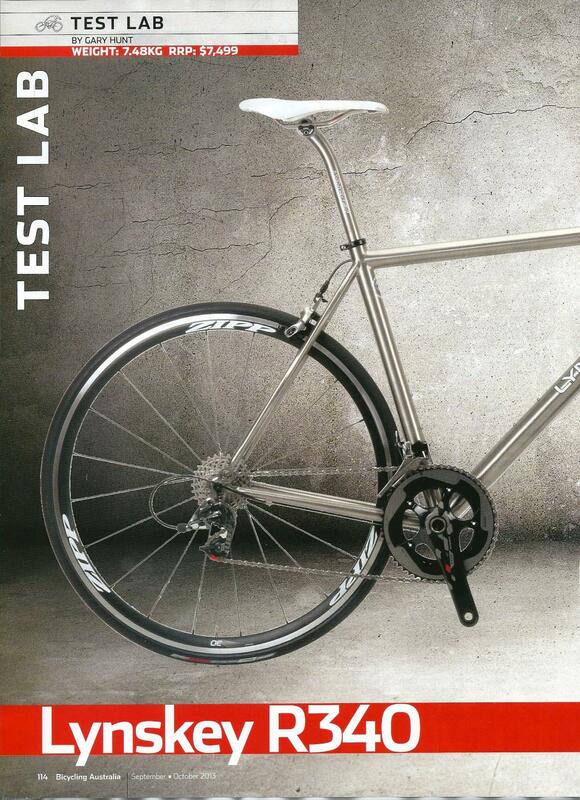 We've got a few people now wondering if a Lynskey might be right for them. Including me! One last thing - if I'd known that this bike was going to be this good, I would probably have gone for an R255 and full carbon fork. 20-20 hindsight! Anyhoo, I won't go on. I hope this feedback is worthwhile. I got back yesterday from an one week 1000 km charity ride around the south of the State. Total ascent 5,600m. 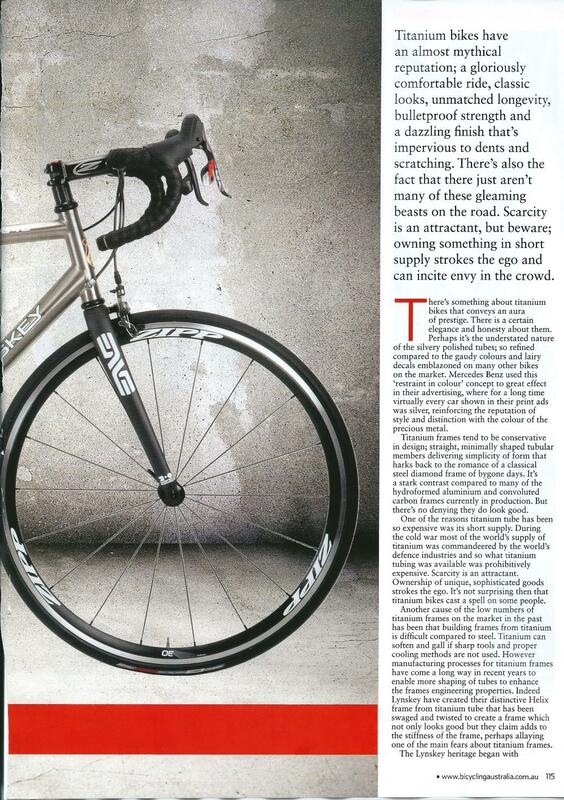 The Lynskey Sportive met all expectations in terms of comfort, speed and manoeuvrability. We averaged about 140 km per day. I was generally at the front in a small group that did most of the work. The wheels performed very well in all respects and I felt confident on descents and bends. We had one incident where four riders came down during a sprint at 45-50 km per hour. I was just behind the crash and could only avoid it by instantly veering left and going off the road onto the gravel and into the bush (a la Armstrong), managing to stay upright and avoid trees. A close shave! Anyway I just wanted to say that I am very happy with the bike. Dear Andy, a short note to let you know the Lynksey is performing very well in the Pyrenees. The gearing selection you made has got me over the largest climbs, including the Osquish, d'Aubisque, Soulor, Tourmalet, d'Aspin and Peyresourde. It's been 5 days of hard going, but enjoyable. The bike is great on the downhills; very stable even a high speed. 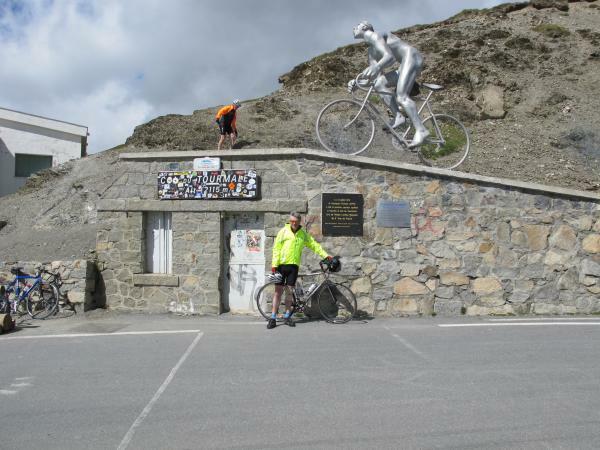 I attached a photo, as promised, at the top of the Tourmalet. Only 10 cols to go in the next 5 days, but I think most of the hardest are behind me. 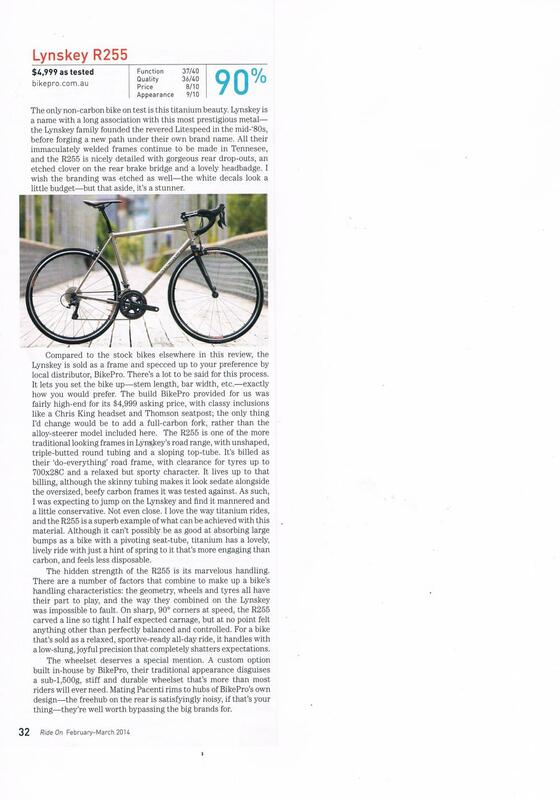 Having been a road cyclist enthusiast for some 15 years over which some 135,000 cumulative kilometres that includes competing some 60 triathlons and enjoying 4 European cycle trips I took Andy's advice (BikePro in Surry Hills) and invested in David Lynsky's latest titanium creation, the 420R - made in USA. How do I rank it - well, having experienced riding fine steel, aluminium, titanium and full carbon fibre, I've now settled again on this 3rd generation titanium -it's truly a beautifully masterpiece of engineering. It weighs in at a very light 7.1 kg fully assembled, immaculately finished, and a delight to ride. I find it exceptionally comfortable with its relaxed angles, incredibly responsive and it loves to accelerate. It feels as though it has a lower centre of gravity that hugs the road and with carbon fork and wheels very absorbing of road vibration. Truly a sensational road bike - it's rekindled my enthusiasm, eased my back soreness, and I look forward to 1000's more k's. I congratulate all the staff at BikePro for a great set up. But I ask BikePro not to sell any more of these - as I want the priviledge to have the only one! In short – the R340 is an awesome bike. Andy and Nick at BikePro built it up for me at the start of the year. I came from spending a few years on a S2. My riding program consists mainly of medium distance fast riding most of which is done with a team. When I was looking at a new bike, I wanted a frame that was race-able but also something I would not be looking to dispose of within 2-3 years. I find that with carbon - cracking and failures aside - I am always chasing innovation and the 'next big thing' and feel compelled to change over and upgrade regularly. One of the beautiful things of titanium is that whilst it has sophisticated butting and tube manipulation, at its core it is still a 'classic' road bike with conventional tube junctions, traditional headset/BB/seatpost standards and a timeless silhouette without ridiculous tube and junction shaping. The traditional standards also enable you to build the bike up exactly as you like without having to resort to proprietary items. The bike becomes personal. First impressions of the bike were immediately positive. Titanium tends to 'glide' along the road and provides an incredible ride quality. However when pushed hard initially I had a few reservations as to its out-and-out high level performance. The biggest factor here is titanium really rewards a perfect pedal stroke. On the S2 or any ultra-rigid carbon frame - your technique can be a little messy as all the energy ends up at the back wheel anyway. This is not quite the case on the R340 – but when you dial it in just right, balance the power between your legs and focus on the sweep and the upstroke as well as the downstroke, the rewards are magnificent. This is because there is a bit of ‘sway’ in the BB and not quite as much torsional resistance so any lateral imbalance is really highlighted. But when you dial it in – the ability to hold speed whilst still ‘gliding’ is fantastic. Cadence is paramount. This is related to the previous point. Really pushing a big gear does not work. I used to push big gears on the Cervelo and when I needed to go faster or accelerate, I’d push harder. This does not work on the R340. However – by increasing cadence and spinning more – as you need to do to maintain perfect pedal stroke – this issue all but disappears. I find myself in the saddle more both during climbs and fast riding, and due to the combo of revised riding style and the inherent comfort of the Ti frame I feel a lot better at the end of the ride. Looking at Strava – this frame does not hold me back in terms of overall performance – but gives me a bike that’s damn enjoyable to ride, provides a point of difference to all the cookie-cutter bikes out there, no stress with durability and leaves me feeling fresh. Whether it's doing the fast Beach Road rides or attacking the dead, undulating roads around the Peninsula this bike can handle it all. Andy was great to talk to and provides very good and honest advice as well as a comprehensive fit service. Nick takes time and pride in building up the bike. From perfectly tuning in a SRAM groupset down to immaculate bar tape wrapping, all details are considered and executed. Dealing with the guys was a pleasure. 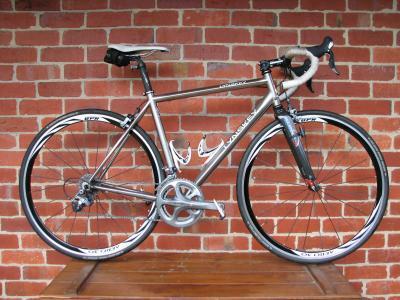 My Lynskey Helix Titanium road bike in medium size built with top components. 6.29kg actual weight complete without pedal! - Lynskey Helix frame, medium size, bright brushed finished with etched lettering (which is an extra US$550 finishing option) Purchased from BikePro Melbourne, the distributor of Lynskey in Australia. - ENVE 1.0 fork, which is the top-of-the-line ENVE fork, lighter than the more common 2.0 version. RRP over US$500. - 2012 (latest model) SRAM Red front derailleur. - 2012 (latest model) SRAM Red XG-1090 cassette 11-28T. This is the improved version which is quieter. - TRP 970SL forged magnesium brakes, decals removed, all black finishes. Superior modulation and feel than 2011 Sram Red brake but has similar stopping power. Much lighter too. As used by Pro-Tour riders. RRP over US$400. - ZIPP Vuma Quad 50/34 compact crankset with ZIPP ceramic bearings. - TUNE BoBo headset. Precision CNC, made in Germany. - Lynskey titanium seat post, decals removed. It blends really well with the frame giving an integrated seatpost (ISP) look. - ZIPP SL SS full carbon handle bar, light and strong with good vibration damping. - Rotor S1 stem. Super stiff and light. Full CNC, made in Spain. Patented DTT bolts reduce stress on carbon steerer and handle bar. - Reynolds MV32UL full carbon clincher wheelset (1284g actual weight, this model is fitted with Reynolds re-branded DT Swiss 240 hubs). As you can see, each component is really top-of-the-line. This is a titanium super bike! The replacement cost is over $9,000. At 6.29kg complete, this is even lighter than most factory spec high end carbon bike. I've previously owned two Cervelo R3s (the original and the current BBright version), a Cervelo Soloist, BMC SLR01. BMC Racemaster, Scott Addict etc and I can honestly tell you NONE of them has a ride quality as good as this Lynskey Helix. As a comparison, riding the R3 or Addict feels like riding a brick and not very enjoyable, the Helix is more lively with good road feel but not harsh like those overly stiff carbon bikes. Handling of the Helix is spot on with "proper" geometry instead of the somewhat weird Cervelo and BMC geometry. Stiffness wise, the Helix is as stiff as the latest Cervelo R3 and the Helix tubing really works! Best of all, titanium frame are built to last and it is much more durable than the relatively fragile and crack-prone light weight carbon bike (let's face it, any sub 900g carbon frames are build for lightweight and stiffest but not durability, it is a fact!). You know, with a lightweight carbon bike, you always worry about paint chipping or frame cracking with minor knocks or fall, you have to really baby it. With the Helix, you won't have such worry, light scratches on the frame can be bluffed off with 3M scotch brite, so handy! And with a build as light as this Helix, you have the best attributes of a carbon and titanium bike, this is just perfect! Did I also mentioned this Helix is 100% made in USA? The craftsmanship is exquisite! I don't know if you remember me, but I was the odd guy from Geelong who bought the red R210 Lynskey frame with the Easton EC90 carbon forks and then various other bits and pieces along the way (as I could afford them) and until I had the necessary parts to put a good bike together. I have had the bike together now for about four months (and some 1500 kms later) - and I just wanted to thank you enormously for your guidance and advice on the right gear to buy. The Lynskey running Campag Veloce (with the solid brake calipers) and Record cables and BB - is simply an incredible machine. It runs as tight and as solid and as light as its first ride. The thing that I can say about the bike is that at 50 kph to 60 kph (down a hill) it's as steady and as smooth as I could ever imagine. 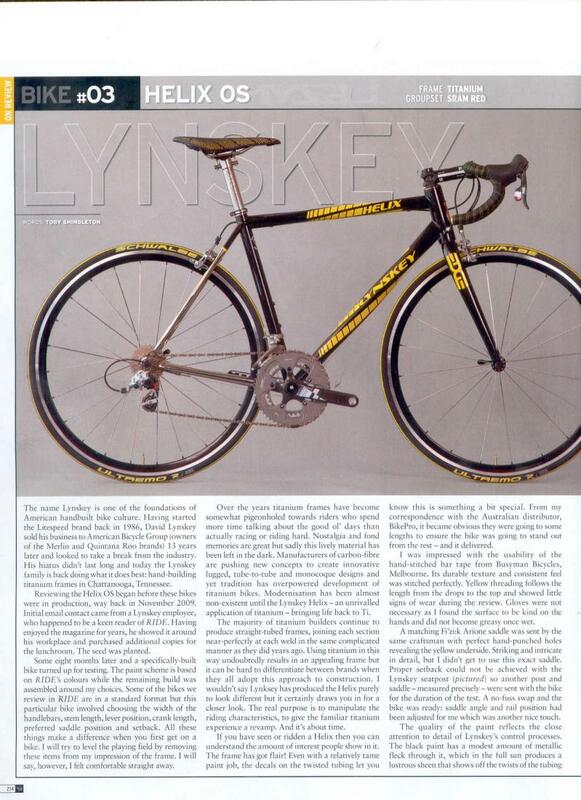 Everything that is written about the Lynskey frame is true. Art and functionality crafted into a perfect ride. The Fulcrum Racing 5's have also been solid over the journey so far. 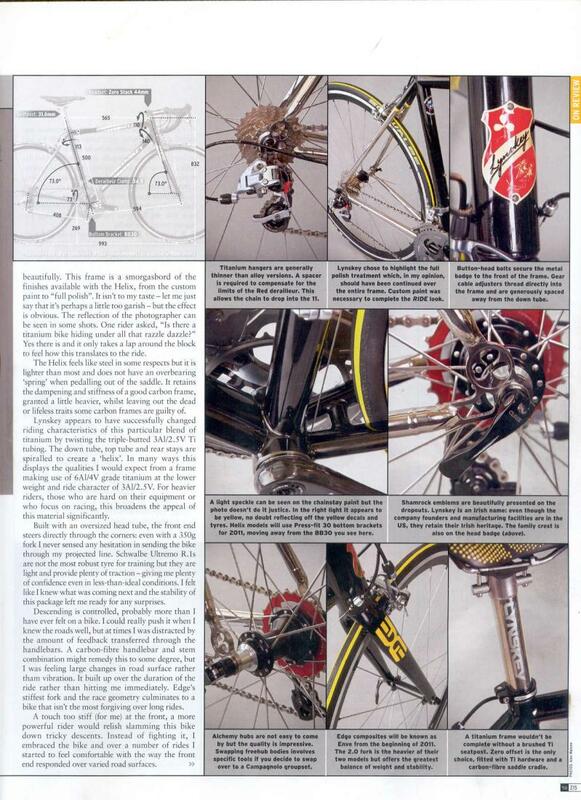 By the way, the Campag group set was also the way to go. Wouldn't change it for quids now. It was by chance that I happened across your store in Surrey Hills - but I can honestly say the service, advice and prices were exceptional. Thanks for doing the job you do, and also to the guys in the store. First class. People who understand bikes and riding. I have enclosed the first photo of the bike for your info (taken after my first ride on it). I only had a temporary drink cage on the bike at the time - so excuse this - I now have two Specialized Ti coloured ones. But otherwise, it's as I run it today (with a difference computer and headlight as well). Buying an expensive bike (unseen) from interstate is a bit risky. But I have been very impressed with your professionalism, your knowledge on frame geometries, wheel build, bike build, and care with the packing has been very comforting. I would have no problems recommending you to other potential interstate customers. The 340r Lynskey was fitted with full Ultegra 2010 group set, TTT ergonomic alloy bars & stem, Italia saddle, PRO alloy seat post, & Bike Pro Aero 30 rims, Continental Grand Prix tyres. The first ride & subsequent 7000 k has been a revelation. To sum it up, three words, supple, responsive & fast. Great ride, great advice, great service – all I get to do now is try to keep on the wheel of the 14 year old son.